I’ve had so much fun this year doing thrift store upcycles and repurposing items from the side of the road. The thrill of the find is fun because you just never know what you will find. This month for Inspire my Creativity Blog Hop, it’s thrift store upcycle time. 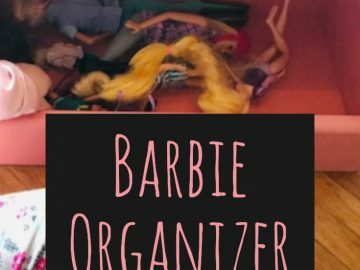 I had two items in my thrift store finds that I am using for this blog hop. 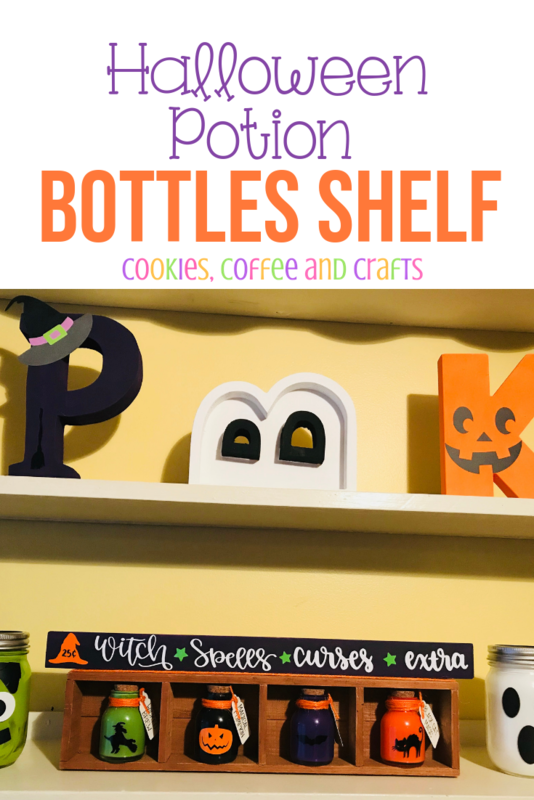 I found this shadow box that I’m turning into a Halloween Potion Bottles Shelf and a witch sign for the top of the shelf. 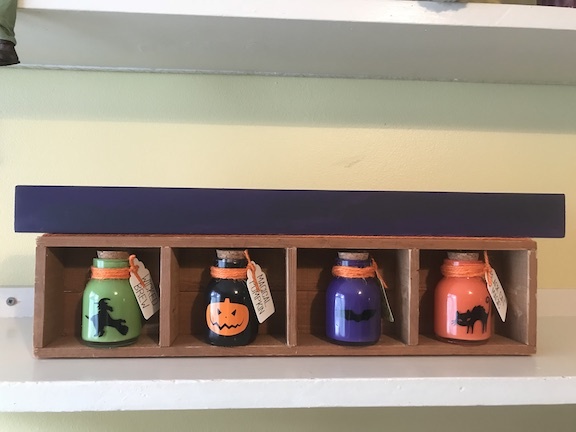 The Magic Halloween Potion Bottles that I made needed a home and the shadow box was perfect for it. I found the shadow box at Goodwill for $2.39. This one didn’t need a lot of work. I’ll tell you whatever glue was used to create this shadow box was good stuff, it was still going strong. For the shadow box I removed all the chickens and flowers and used a craft knife to remove the glue. 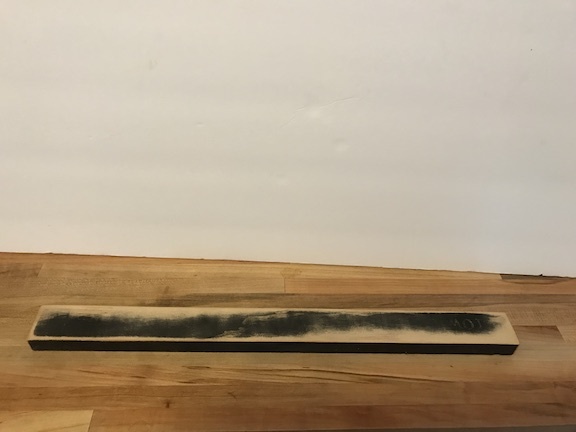 Then I sanded down the areas where the glue was. This box has the perfect amount of rustic for a witches potion shelf. 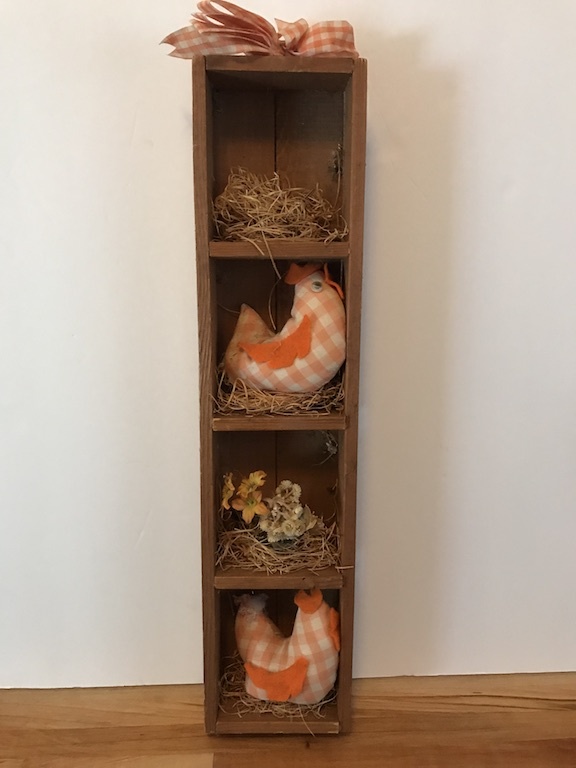 I wrapped orange jute around the shelf and glued the ends with hot glue at the bottom. 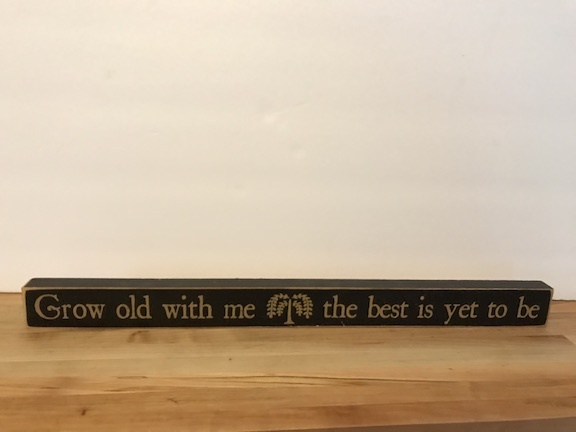 Now for the witch sign, I found this sign for $1.68 at the thrift store and it still had the $6.99 price tag form Marshalls on it. I sanded down the front of the sign to remove the letters and left a little bit of the black. Then I painted it Royal Purple because I like to add in dark purple to my Halloween decor. I painted just the front of the sign and left the edges black. The paint job on the sign came out awesome with the black showing through the purple. In Cricut Design Space™ I created the design for the sign. Using my Cricut Maker I cut the design in permanent vinyl. Using transfer tape, I added it to my sign. 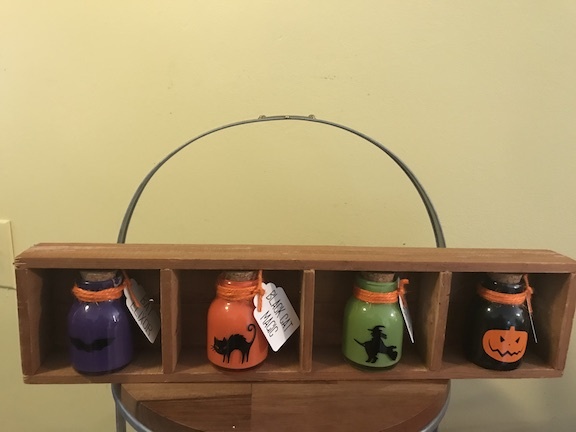 Any witch would be happy with this potions shelf and it makes super cute Halloween Decor. The other reason I love thrift store finds, is to give items a second chance to be something new. 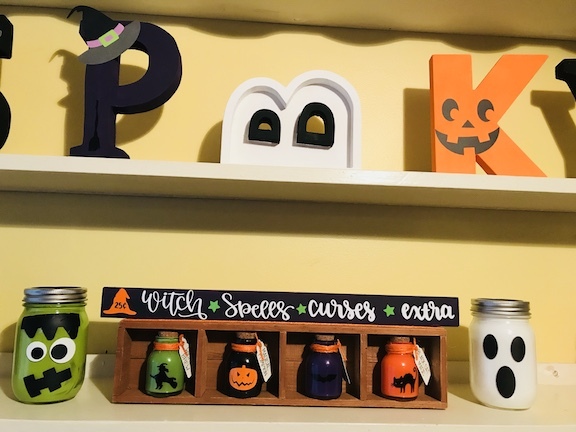 Find out more about my other DIY Halloween Decor Here . Visit all of my friends at the Inspire My Creativity Link Party to see what they created. Please join us next month for Inspire My Creativity Link Party on the second Wednesday of each month. 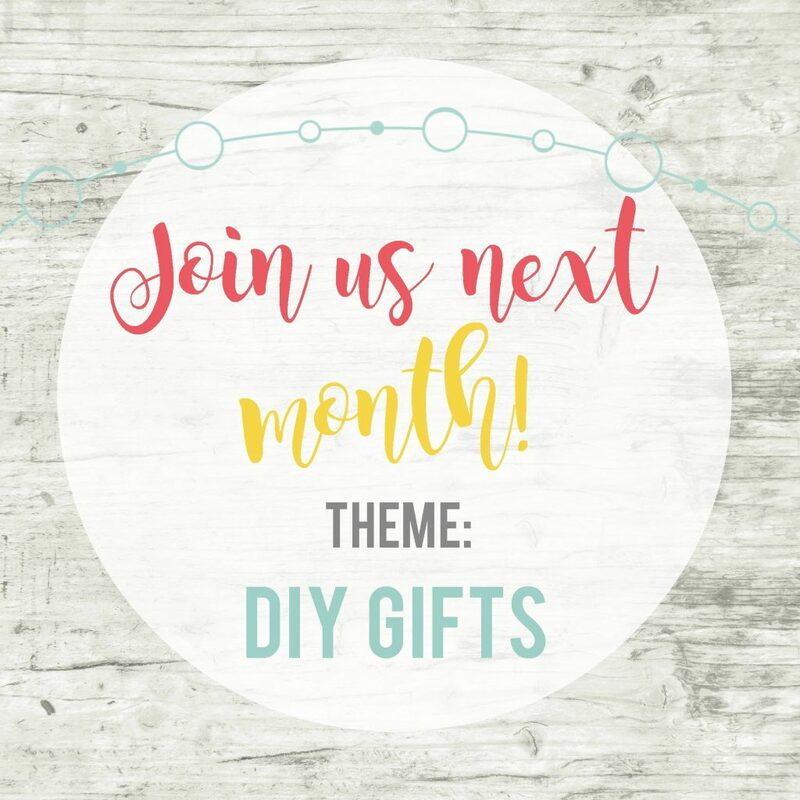 I can’t wait to see your creativity with a DIY Gift idea.